Audio Technica announces the ATM350a series, an updated version of its ATM350 series of Cardioid Condenser Instrument Microphone. Remic Microphones have launched a Kickstarter campaign to fund their new W3000 project, a dedicated microphone for woodwind and brasswind instruments. This month, sE Electronics offers the opportunity to win 15 sE5 small-diaphragm condenser microphones. JZ Microphones announces that they are taking over the full production of the Flamingo series of mics formerly sold by Violet Design. AKG is at Musikmesse where they are introducing different microphones, including the C314 condenser model. 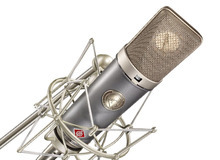 Tascam introduces a new very affordable condenser microphone for home studio, the TM-80. CAD introduces an evolution of the U37, the U39 USB condenser microphone equipped with a headphone monitoring circuit.